Rather than taking for granted the ubiquitous typology of the skyscraper, the archival works displayed in the "High-Rise Archive Gallery" explore the vertical possibilities for a sustainable and inspiring workplace. Some of these works have been selected for this collection. In their attention to creating flexible, light-filled office floors complimented by green spaces, these buildings bring to life early explorations of the Climatroffice created in collaboration with Buckminster Fuller in 1971. 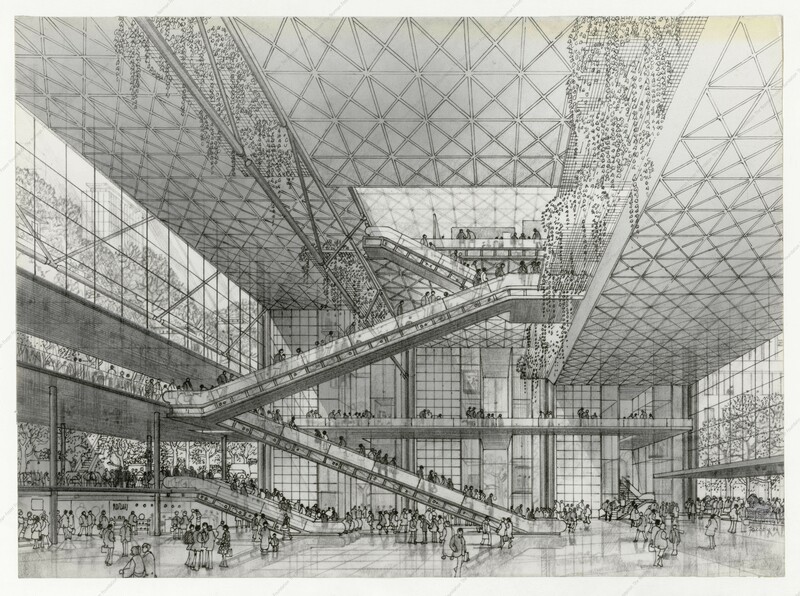 In 1971, Fuller and Foster envisioned the Climatroffice, a scheme for a revolutionary workplace composed of existing structures, new buildings, and green spaces under a glass diagrid envelope. Along with its early influence on buildings such as the open-plan, communitarian workplace of Willis Faber and Dumas Headquarters, the development of the Millennium Tower in Tokyo signals the translation of many of its principles into the vertical realm. The Millennium Tower's structural diagrid skin marks a departure from its two high-rise antecedents by Foster, the Hongkong and Shanghai Banking Corporation (HKSBC) Headquarters and Century Tower, both of which feature highly articulated structural elements separate from its envelope. Similar to the internal organisation of HKSBC's atrium and floor groupings, the Millennium Tower's five-story atriums would mirror the urban functions of a street or plaza for this building which proposed integrating many uses in a single high-rise. The models of Commerzbank Frankfurt demonstrate the adaptation of HKSBC's serviced cores to the vertexes of a triangular plan. While the building's structure is integrated under a skin in contrast to HKSBC, the elevation of the Commerzbank model similarly articulate groups of open plan office floors organized around a central atrium. Alternating garden atriums are imagined in the process drawings and ultimately rendered visible in the multi-storey glass curtain walls of the final model. 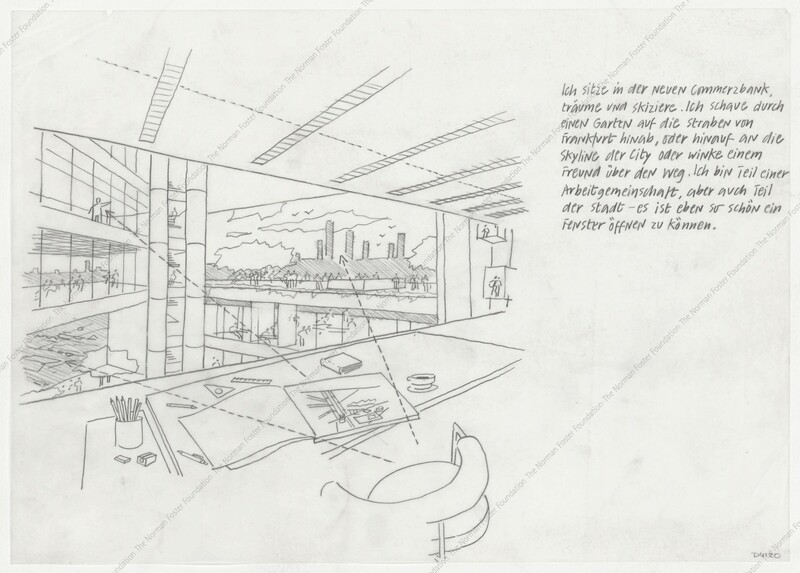 The drawing from the perspective of a worker's desk alludes to the way in which the building creates sightlines between working spaces, introduces natural light and ventilation to every office, and breaks up the large tower into units that foster connection through communal space. 30 St. Mary's Axe represents the fusion of the ecological principles first developed at Commerzbank with a diagrid skin resembling that of the Milennium Tower. As seen in the initial process drawings, 30 St. Mary's Axe derives its shape from the site's wind patterns and uses them to harness natural ventilation as an energy-saving strategy. The process models show the way in which cutting and rotating the floor plate throughout the building's height creates six vertical channels which circumscribe the tower. Similar to the clusters of Commerzbank, these channels establish landings, daylighting, and sight lines between what would conventionally be segmented office floors.